Geothermal drilling rigs are big and complicated looking pieces of machinery. In this photo workman are beginning the drilling process by drilling through soil and clay until. Once they are though the soil they will change to a drill bit that can cut through rock. In our yard they hit rock about 30 feet down (we do live in Rockville, Maryland). They then had 270 feet of rock to drill though. 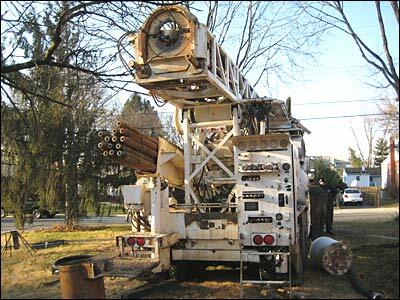 Geothermal drilling rigs can also be used from drilling ordinary wells. In our yard they hit water at about 125 feet (the water didn't gush out or anything since it wasn't under any pressure). I couldn't really tell the difference since they were pumping water in to cool the drill bit and push out the ground rock. You can see the difference between the two drill bits below. The rock bit is shaped more like bits used in handheld drills and can slowly grind though rock. The mud/soil bit is more suited for quickly cutting through soil. While drilling geothermal drilling rigs make a lot of noise. This is mostly due to the large truck but the drilling itself isn't all that quiet. The workmen usually wore ear protection while they were drilling. Return to www.TheGeoExchange.org or Take the Tour and see the entire installation process.